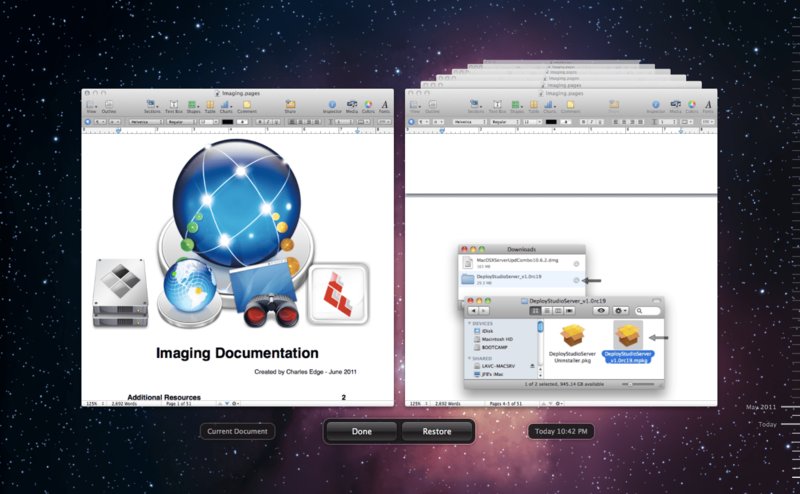 In Mac OS X Lion, applications can make use of a feature to auto-save and version files. This feature locks files that are inactive for editing and when the file is unlocked then starts automatically saving versions. If you have a problem with the file you can then always step back to a previous version of the file. The feature is manifested in the title bar and the file menu of applications that make use of it. When you open a file, it can be locked. Viewing the file in the Finder also shows that it is locked. Clicking on locked provides the option to unlock. Once unlocked you can make changes as you normally would. The next time you save the file, a version is created. Hovering the mouse over the title of a file results in a disclosure triangle. clicking that results in some options otherwise located in the file menu. Clicking on the Lock option again locks the file. Files inactive can automatically be locked as well. 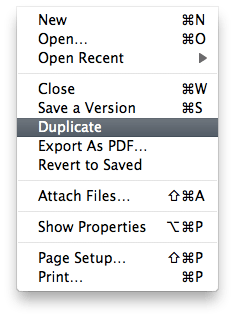 The Duplication option is similar to that of Save As. You are asked where you want to duplicate the file to. No versioning information is sent with the file. These same options are in the File menu as well. Initially I had read that Time Machine was required to make use of this feature. That is incorrect. It works perfectly well with Time Machine disabled. Having said this, the app does report a message about Time Machine but this can safely be disregarded. Large (> 500 page files) will auto-save very slowly if you have made a lot of changes in them. This is due to the fact that versioning results in copy operations. Root can traverse into other users version files. I have found no way thus far to change the auto-save interval (will hopefully update this when I do). Pasting graphics into large files is much slower than previous versions (but likely offset by the new ability to flip through versions of files). Not all applications have built-in Versions options yet (e.g. Office) but I think most will at some point in the future. In the applications that ship as part of Mac OS X v10.7, users no longer need to save documents explicitly or be concerned about losing unsaved changes. Document-based Cocoa applications can opt into this autosaving behavior with a simple override. With automatic saving enabled, the system automatically writes document data to disk as necessary so that data displayed in a document window is, in effect, always the same as the document data on disk. A file coordination mechanism maintains sequential access to files. (See “Mac OS X File Coordination.”) Applications that support automatic saving also support document version history browsing. To browse previous versions of a document, choose Browse All Versions from the pull-down menu at the right end of the menu bar. For more on NSDocumentController here’s Apple’s page for that. Overall, Versions has taken me a little while to get used to. Especially in TextEdit. But I’ll take the latency in exchange for the ability to roll back changes. If you are rolling out Lion in a larger environment, you’re going to want to check out whether or not users expect this to persist across network shares, copying files to additional computers or even backups in many cases.